DOUBTING YOURSELF TO THE BONE IS A STORY about the nature of grief, about what it means to be a parent in the face of great sorrow, the idea of re-invented love and hope. Set in Paris and a small town in the Canadian Rockies, the novel is propelled forward by a horrific car crash that reverberates for the victim’s husband and daughters. Doubting Yourself to the Bone is a book about the pathology of grief. From a scotch-swilling Tibetan monk to a titillating, imagined waif named Katya, whose uninvited visits are always intriguing, this story serpentines through the labyrinth of grief and pain as the victim’s husband wrestles with the question, was the car crash an accident or intentional? It’s a bumpy and strange journey, peopled with a capricious mother, an aging alcoholic uncle, and five Buddhist monks in a broken van that leads its main character and the reader on the road to salvation. “This is the second novel from an Edmonton writer who is also a noted local poet and playwright. 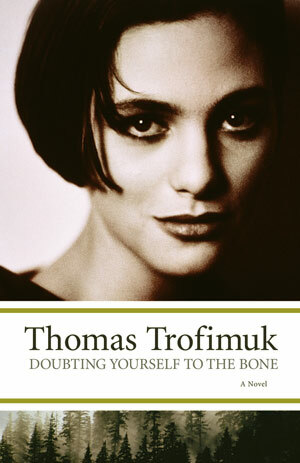 Trofimuk’s first novel, The 52nd Poem, won the 2003 Alberta Book Awards’ Georges Bugnet Novel of the Year, the City of Edmonton Book Prize and the Manuela Dias Book Design of the Year Award. This new story plays out in Edmonton, Field, B.C. and Paris, and traverses difficult emotional territory with great beauty and delicacy. Perhaps more poets should be novelists, to show that a wrought sentence can shine much, much brighter than the heavy bricks other writers lay down in the name of fiction. Doubting Yourself to the Bone is a story of unresolved grief, about family, about big issues that are groundwork of great literature. “Ronin, much like the protagonist in Gao Xingjian’s Soul Mountain, talks to imaginary characters, incorporates multiple points of view and invites us to delight in the oddities of life, like a busload of saffron-robed monks that land in Field, a nudist lesbian and an imagined waif named Katya.